The first was named “Clash Me Doun”, a most appropriate name for its fate. The second, which seemed in quite fair condition, was Breich Mill, and a good many people alive must remember it still. 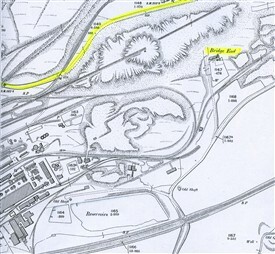 Bridge End farm (Clash Me Doun) can be seen on this map of 1897. Before the area was mapped again in 1907, the bing had engulfed the farmhouse. 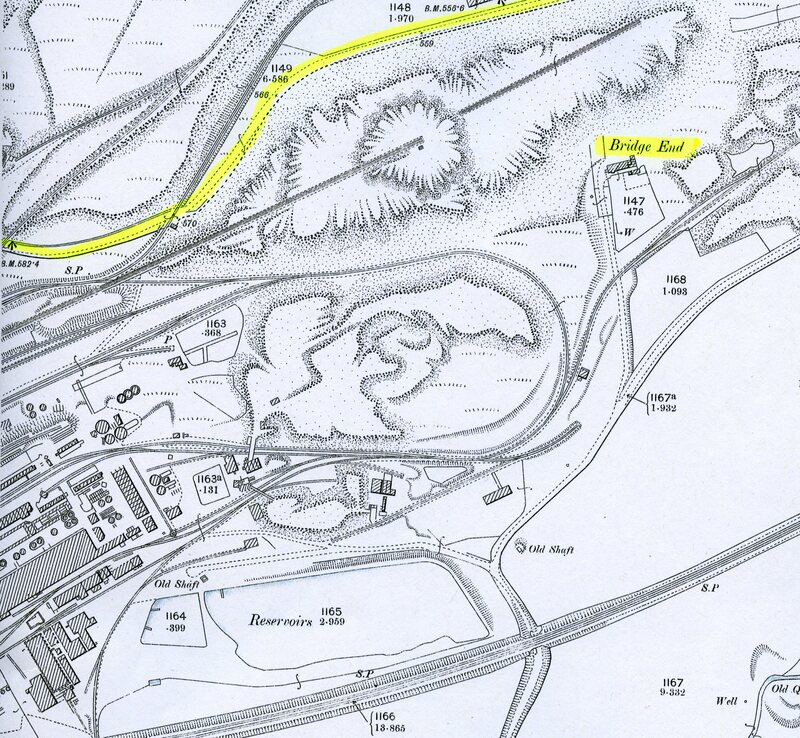 Its position was between the new part of the low road to West Calder, north of the bing which is marked by a sleeper fence, and the old road which cut right through from the railway crossing at the start of the bing to the road at Burnhouse Farm. The old road was still in use a little less than forty years ago. The site of Burnhouse Farm is uncovered, although the buildings were demolished at a still later date. The garden wall still stands to some extent with tall ash trees in front, on the road west of the Drove Loan where the small Army Camp was during wartime. In 1900, the Oil Works was retorting over 4,000 tons of shale every week. After extracting the oil, some 3,000 tons of spent shale were being dumped every week on the bings. No wonder they grew so huge! 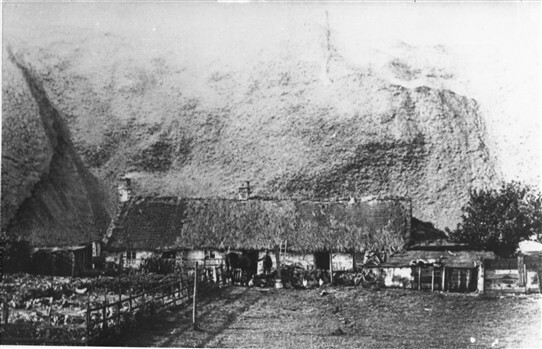 Burnt shale was first tipped on the red bing west of Addiewell Farm and opposite the church. At that time it was not so well burnt as at present, and was taken up by a small engine known as “the black stuff” engine. This bing went out of use when it went on fire and burned fiercely owing to the condition of the shale. A tarry substance liberated by the heat ran down the sides and quite an amount of this lodged on a lower level on the south-west side. This still remained, at least up to recent years and during hot summer weather it was a favourite game for children to make footprints with their bare feet in it. Excerpt from a longer article on old Addiewell in the Midlothian Advertiser, 6 January 1950, page 6. The whole article can be opened as a PDF attachment at the foot of this page. Article in the Midlothian Advertiser, 6 January 1950. This page was added by Sybil Cavanagh on 14/04/2012.